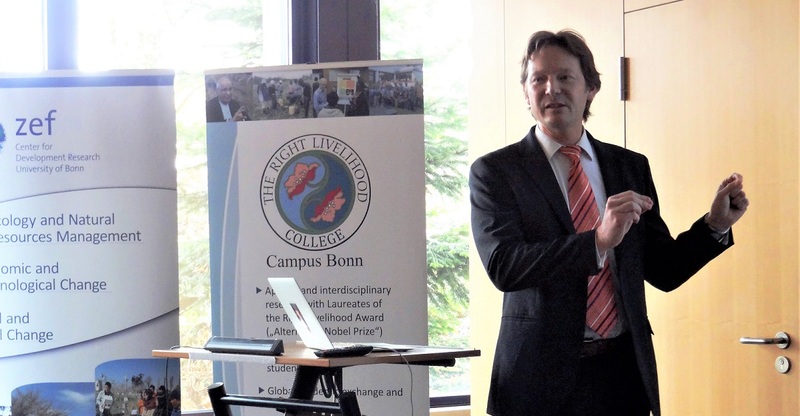 On November 22, 2018, Prof. Dr. Felix Fuders from the RLC Campus in Valdivia, Chile, gave a talk on “How to fulfil the SDG’s: The role of money” at the RLC Campus Bonn. Fuders pointed out that the global financial system forces the obligation to economic growth. Economic growth is carried out exponentially, but as the earthly resources are finite, the whole system will collapse eventually and therefore economic growth is a contradiction to sustainability. In the context of the SDG’s (Sustainable Development Goals), Fuders argued that SDG No. 8, namely “Economic Growth” is the least recognised cause for market failure and thus contradicts the achievements of the remaining SDG’s. If you want to learn more about Felix Fuder’s work on the crises of the global capitalist economy and alternatives, click here for a download link to the essay “Local Money as Solution to Capitalist Global Financial Crises”. Fuders, Felix (et.al.) (2014) “Local Money as Solution to Capitalist Global Financial Crises”. In: Pirson, M., Mulryne, J.R. (eds.) From Capitalistic to Humanistic Business. Palgrave Macmillan, pp. 48-70.